The Bothy is a wonderfully situated, recently converted stone cowshed. Positioned in the centre of the Edwinsford Estate, it is approached by just over a mile of private track, and enjoys some of the finest views of Carmarthenshire, a place that time seems to have left behind. There is a shower room, with a shower, lavatory and wash basin. It has a comfortable centrally heated open plan living area, which consists of a kitchen area, and a sleeping area. 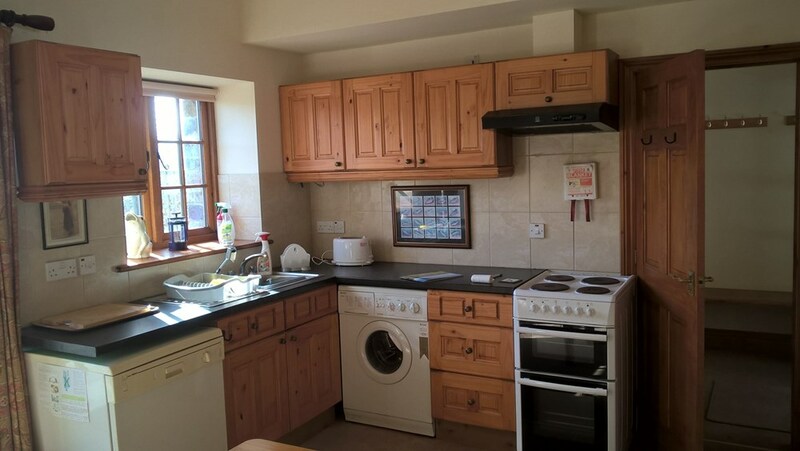 The kitchen area consists of an electric cooker, microwave, fridge, washing machine and dishwasher. The sleeping area can either provide twin single beds or a king size double. There is also a Z bed if required. It also contains a built in wardrobe, a sofa, a chest of draws as well as various chairs and a table. Outside is a terrace with some garden furniture and a barbecue. Dogs. Well behaved and fully house trained dogs are welcome in the Bothy. Otherwise it is asked that dogs are kept in their owners vehicles. Packed lunches and ready to cook meals are available with advanced booking. Edwinsford is a short cycling distance to Abergorlech from where one can join the Gorlech Trail. The Estate boasts over ten miles of private tracks and paths with amazing panoramic views from its high point. It is also close to the Brecon Beacons. With Llyn y Fan and Carreg Cennen Castle both well worth a visit. There is an abundance of bird life to be enjoyed on the Estate but it is also within easy driving distance of Cwm Clydach, Dinas and Ramsey Island all of which are R.S.P.B reserves. Aberglasney House and Gardens and Dinefwr Park are close to Llandeilo. The National Botanical Gardens of Wales are not far away at Middleton Hall, Llanarthne. For those wanting to venture a little further Picton Castle and its Gardens are well worth a visit. It is important to remember that most of the local pubs are closed on Mondays. The Black Lion in Abergorlech and the Forest Arms in Brechfa both do good pub food in a warm friendly atmosphere, if wishing to eat it can pay to book in advance. The Ginhaus Deli in Llandeilo also has a very good lunch menu. Llandeilo is the boutique town of Carmarthenshire, it has good butchers, a baker and a green grocer. It also has a CoOp store. There are Antique shops, a Toast and the Ginhaus Deli which stocks an amazing selection of gins as well as other delicacies.